Fêted as the ‘herb of grace’ and ‘the thinking person’s herb‘, Brahmi oil gifts you mental clarity by alleviating all kinds of mental ailments with its neuro-pharmacological effects. Being the second highest ranked herb in Ayurveda, Brahmi oil is the main component of numerous traditional and folklore medicines in dealing with Attention deficit-hyperactivity disorder (ADHD), weak memory, stress, anxiety, fear, epilepsy and Alzheimer’s disease. Commonly called as ‘Brahmi’ in Ayurveda, “it is known as the rejuvenator for all systems in the body and is one of the most commonly used medicated oils”, quotes the book on Ayurveda and Aromatherapy. As a cognitive enhancer, stress buster and neurological tonic, Ayurveda widely uses Brahmi oil for its nootropic, antimicrobial, anti-aging, antipyretic, cardio-tonic and analgesic attributes. The oblong juicy leaves of this herb, when put under steam distillation yields Brahmi Oil, which is known for its stimulating properties used for enhancing the efficiency of the brain in terms of accuracy, intelligence and attention and mostly prescribed for children to make them more studious, active and attentive. Bearing India as its origin, Bacopa monnieri has numerous vernacular names, the most common of which is ‘Brahmi’ as it is called in Ayurveda which is derived from the Sanskrit word ‘Brahma’, the creator of the Universe as per the Hindu mythology. This creeping herb is botanically named as ‘Bacopa monnieri‘ and it commonly grows in countries like Southern India, Europe, Australia and North and South America. With extensive utilization in Ayurveda, proof of the existence of Bacopa monnieri in literature dates back to the 6th Century A.D where it is mentioned in the Vedas or the sacred books of the Hindu religion and in Charaka Samhita as well as Sushruta Samhita, the Ayurvedic Encyclopedias. Sushruta, the father of surgery calls Brahmi by the name samjna sthapana which means ‘ that which brings back consciousness’ and medhya rasayana, meaning its application to make one intellectual with less mental deficits. Allegedly used by the primitive Vedic scholars in aiding them to memorize the sacred hymns and scriptures, Brahmi oil played a major role in treating neural disorders in Indian as well as Japanese traditional medicine. Being in use for almost 3000 golden years in the Ayurvedic healing system, Brahmi oil is a traditional cure for all kinds of nervous disorders, Parkinson’s disease, epilepsy, hair loss, premature aging and skin diseases. With natural phyto-chemicals that rejuvenate the brain and the nerves, Brahmi oil plays the role of a healthy tonic stimulating and strengthening the nerves and the cardiac system. Along with the other renowned Ayurvedic herbs such as Jatamansi and Ashwagandha, Brahmi essential oil is taken along with ghee which itself has numerous medicinal benefits, to treat cough, circulatory disorders and even function as a laxative. Traditionally administered to children for active functioning and improved intelligence, Brahmi oil is paired along with Centella Asiatica and given to pregnant women along with milk to facilitate childbirth. It was also used as a laxative to treat constipation, flatulence and to treat tumors, inflammations and even as an antidote to snake bites. Widely recognized as a neural tonic, Brahmi oil owes its tribute to the presence of saponins in particular bacoside A and B. 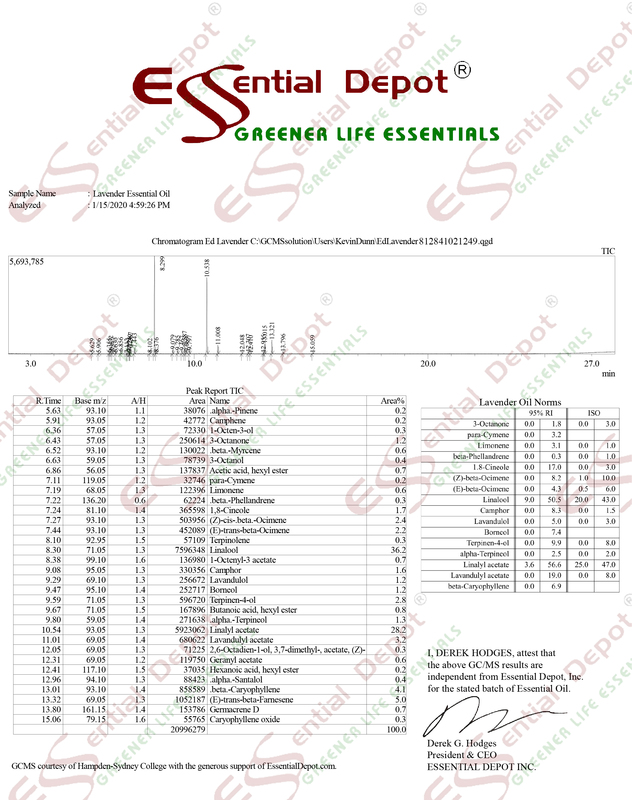 The other chemical components include alkaloids and sterols such as bacopasides, brahmine, herpestine, d-mannitol, hersaponin, monnierin, betulic acid, beta sitosterol, bacosine, luteolin, quercetin, apigenin and nicotine. The therapeutic properties of Brahmi oil are cardio-tonic, nootropic, antipyretic, antioxidant, anti-inflammatory, analgesic, antimicrobial, anti-aging, expectorant, sedative, stomachic, antiepileptic, carminative, astringent and cognitive. Ayurveda is a 5,000 years old traditional healing methodology that has its roots deeply vested with the Indian mythology, the country with the world’s oldest history. Ayurvedic writings were first said to have been a part of Atharvaveda, one among the 4 Vedas or the sacred books of Hinduism. Furthermore numerous other diseases and their Ayurvedic remedies were written by the greatest Ayurvedic philosophers Charaka and Sushruta in the books Charaka Samhita and Sushruta Samhita. Ayurvedic healing recommends natural remedies for treating humanity since it trusts that the whole thing on earth is a part of nature and Nature by itself has inherent medicines for healing various health conditions. As per this ancient science, a person is said to be healthy when his/her body, mind and soul are in absolute balance with nature. Sickness or disease as per the Ayurvedic philosophy is a fruitful opportunity to find, treat and reinstate perfect health and to help in being in harmony with nature. Mother Nature is made up of five vital elements. They are water, fire, earth, space and air. Being a part of nature, human body is also made up of these five elements represented in the system in the form of three dynamic energies known as doshas. They are vata, kapha, and pitta doshas. These 3 doshas join together to form the unique individual constitution or prakriti of a person and the order of these biological energies are determined by nature itself. Every individual has a predominance of any one of these doshas and it has an upper hand in determining the character, personality and other behavioral attributes of a human being. Perfect balance between these doshas indicates robustness and imbalance leads to illnesses. Every Ayurvedic treatment begins with the effort to identify the unique individual constitution of a person. This assists in finding the mental and physical attributes along with the part of doshas present in an individual. Ayurveda prescribes unique remedies for every individual as per their individual constitution, even if it is for the same disease. The Ayurvedic healing system aids in preventing illnesses in the future and lead to longevity through healthy aging, mainly by treating the root cause of an illness instead of its symptoms alone. The chief Ayurvedic remedies are essential oils, herbs, yoga, simple physical exercises, meditation, Pranayama, prayers, Ayurvedic massaging, Ayurvedic routine, and Panchakarma or the Ayurvedic detox techniques. Brahmi essential oil is said to pacify vata, pitta and kapha imbalances. As a divine blessing to numerous diseases related to the brain and nerves, Brahmi essential oil is indeed one of the most effective natural cure for Alzheimer’s disease and is often portrayed by neuropsychiatric and behavioral changes where a person suffers from memory loss along with losing the ability to think and speak, completely reliable on caregivers in the most advanced stage. With no accurate cure, the symptoms worsen with the progress of the disease and it eventually leads to the death of a person. With natural sulfhydryl and polyphenols, Brahmi oil possesses endogenous antioxidant and anti-cholinesterase attributes with the help of which it inhibits the acetyl cholinesterase enzyme and reverses the symptoms of amnesia, enhances cognition and acts as a neuroprotectant against Alzheimer’s disease. Moreover, researches have proved the efficiency of Brahmi oil in reducing the beta-amyloid deposits found in the brain of rats with Alzheimer’s disease induced by anti-cholinergic drugs. The presence of saponins helps in increasing the level of serotonin while decreasing that of dopamine widely aiding in memory retention. With its anti-oxidant properties, Brahmi oil reduces the reactive oxygen scavengers, divalent metals, suppresses the lipoxygenase activity and decreases the formation of lipid peroxides thus greatly helping in alleviating various hazardous symptoms of Alzheimer’s disease in the long run. Meditating by focusing the mind on Agna or the point below the center of the forehead, appropriately in between the eyebrows, is the best way to improve concentration, activate the brain cells, enhance memory power, grant increased sense of awareness, provide absolute control over senses, and promotes the power of concentration. This point is connected to the pituitary gland and is associated with the life-force. Adding 2 drops of Brahmi oil in diffuser or vaporizer during Agna meditation helps in treating Alzheimer’s disease and is a boon to people suffering from all kinds of brain disorders. 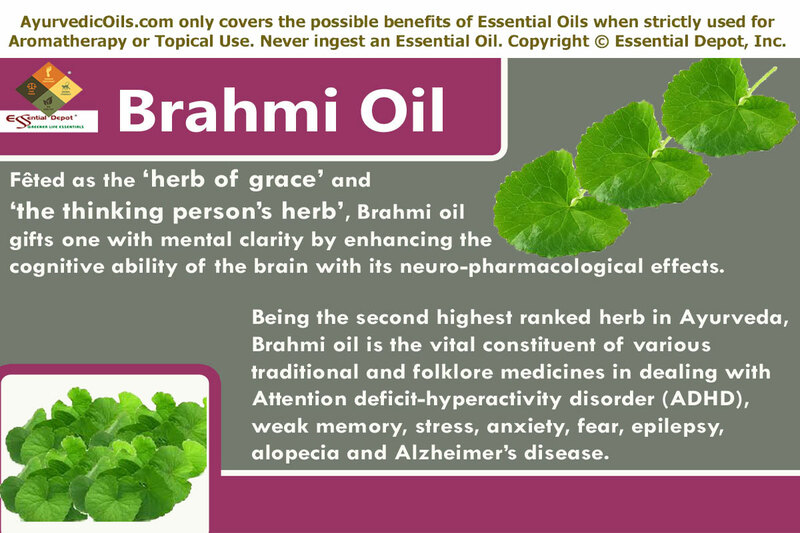 Brahmi oil is Mother Nature’s gift for supporting cognitive enhancement and neuro-protective attributes. This is attributed to the rich content of saponins such as Bacoside A and B. It actively influences in regulating the levels of dopamine and serotonin, the neurotransmitters released by the nerve cells that pass on signals to other nerve cells that help in motor control, secretion of hormones and is the contributor of feeling of well being and happiness that makes you feel secure and complete. With its antioxidant properties, it induces cell transport, metabolism of 5-HT and Tryptophan Hydroxylase (TPH2) resulting in providing a protective environment for the cells and promoting the neuron communication. It helps in increasing the branching points in the neurons and the dendritic intersections that results in the neuronal growth in hippocampus, the area in brain associated with enhancing memory retention and improvement in the learning performance. This also results in increasing the encoding of information in the brain with increased retention speeds, improving delayed recall and verbal learning. 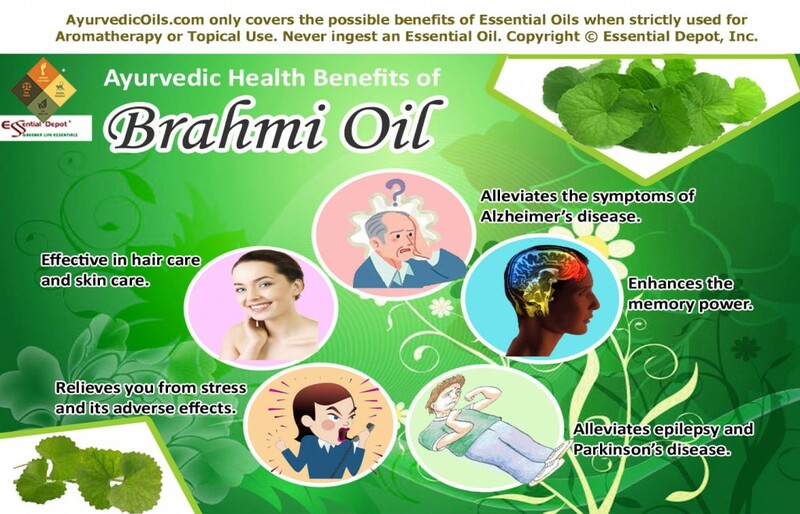 All these aspects of Brahmi essential oil make it an excellent aid when administered along with Ashwagandha, Centella Asiatica and Melissa Officinalis for children with attention deficit hyperactivity disorder (ADHD). It is for this reason, Brahmi oil has been in existence since primordial times in the field of holistic healing as a powerful memory enhancer to increase the speed of processing information and cognition and decrease the performance time, reaction time and error incidence for people of all ages especially children for good progress in the field of academic learning. Adding 2 drops of Brahmi oil to a cotton ball and keeping it besides you during the study time or during your classes can aid in improving your memory power, enhancing concentration and helping you focus on things that you work upon without any deviation. Often characterized by undetectable periods of vigorous shaking, epilepsy is a group of long-term neurological disorders. With Bacoside –A as the major component, Brahmi essential oil is often paired with Ghee in Ayurveda to treat epilepsy by reducing the occurrence of convulsion. It induces changes in specific parts of the brain such as striatum and the hippocampus to mediate the reducing activity of the epileptic seizures. Brahmi oil greatly influences the expression of mGluR8 receptors which possess protective mechanism against excito toxicity and hyper excitation. Additionally, Brahmi oil prevents the depletion of dopamine and serotonin and greatly reduces the death of cells in the midbrain that generate dopamine, which remains as one of the causes of Parkinson’s disease. Numerous researches carried out in this regard confirmed the positive reduction of the depletion of serotonin and dopamine in rats subjected to chronic stress and supplemented with Bacopa monnieri. It has also been proved that the presence of Brahmi oil prevented the depletion of dopamine even in cases of neurotoxicity induced with rotenone and caffeine. Stress simply leads to mental and physical exhaustion, while it drains out all our energy and confidence. Having all the beneficial saponins and phyto chemicals in possession, Brahmi oil acts as a natural adaptogen actively preventing the biochemical effects of stress and blocking the stress response in the body. It effectively reduces the expression of HSP70, a biomarker of stress in almost all the regions of the brain in particular the hippocampus and the cerebellum. Brahmi oil also increases the anti-oxidant enzymes such as superoxide dismutase, catalase and glutathione peroxide in the brain protecting it from oxidative damage and other stress related factors. It aids in overcoming acute and chronic stress. In addition to that this oil for the mind helps one in overcoming addiction to ill habits such as drug dependence, smoking, alcoholism etc. Furthermore, Brahmi oil assists in reducing the inflammation in the nerves and possesses neurological anti-aging effect. With the presence of bacopaside I, bacopaside II and bacopasaponsin C, Brahmi oil naturally alleviates depression and anxiety. Just a gentle massage with Brahmi oil effectively relieves you from tension and fear and provides you a peaceful sleep. It lifts up your spirits and soothes your mind by calming down the nerves with a promise to provide you an eternal elevation. The best way to alleviate stress is to blend 5 drops of Brahmi oil with 5 drops of Sandalwood oil, 5 drops of Lavender oil and 5 drops of Ylang Ylang oil with 10 ml of Virgin olive oil and massage your system followed by a warm bath diluted with 3 drops of Brahmi oil especially before going to bed can help you in relaxing your nerves, soothing your muscles, alleviating fatigue mentally and physically and grant you the determination to fight stress and its ill effects. Healthy hair and skin are indeed the lustrous assets of every human being. With natural antioxidants, Brahmi oil rejuvenates the hair follicles and strengthens the hair from the roots. It acts as a cure to numerous problems related to hair and scalp such as dandruff, split ends, itchiness in the scalp and formation of flakes. “Brahmi is excellent for hair growth and the prevention of baldness”, says Bryan Miller and Light Miller in their book Ayurveda and Aromatherapy. With its nourishing properties, Brahmi oil aids in lessening hair fall and promotes hair growth aiding in the treatment of Alopecia Areata. In combination with Amla, it promotes the blood circulation in the scalp; it aids in restoring the natural color of the hair and prevents premature graying. Massaging your scalp and hair with 2 drops of Brahmi oil along with 2 drops of Jatamansi oil, 2 drops of Rosemary oil and 2 drops of Tea tree oil with 5 ml of Almond oil followed by regular shampooing with 1 drop of Brahmi oil to your mild shampoo, can assist in controlling hair loss, clear dandruff, nourish the scalp, strengthen your hair from the roots and gift you with long, lustrous and shiny locks. The antioxidant attribute of Brahmi oil mainly due to the presence of flavonoids, alkaloids and saponins also contribute to the utilization of this essential oil in the field of skin care as a revitalizing agent. It helps in tightening the pores and keeps the cells in tact by preventing the formation of wrinkles and treats numerous skin problems such as boils, psoriasis, abscess, eczema and pimples. Mix 1 drop of Brahmi oil with 1 drop of Sandalwood oil, 1drop of Rose oil and 1 drop of Lavender oil with 2 ml of coconut oil and massage it on your facial skin in gentle circular movements for visible results. It also promotes the growth of nails. Brahmi oil possesses stomachic properties that assist in protecting against ulcers by repairing and preventing the lining of the stomach from the advent of acids and enzymes. It aids in protecting against the risk factors of cardiovascular diseases by helping in oxidizing the fats in the body. Brahmi oil also acts a diuretic and helps in removing excess toxins from the body in the form of urine and sweat. It acts as a cardio-tonic, nerve tonic and as an analgesic helping you to relieve from pain. This article is just for educational uses and is not destined to check, treat or diagnose any medical condition or replace with any prescription medicines or expert medical advice. We are not medical professionals and this data is shared only with the idea of throwing light on the significance of Ayurveda, the time-honored wisdom of holistic healing. Internal use of essential oils is strictly restricted except under medical supervision. Make certain that you dilute essential oils before using it topically because pure and organic essential oils are highly concentrated liquids and direct application on the skin may cause allergic reactions. It is always recommended to speak with your Ayurvedic expert/ healthcare professional before choosing the suitable essential oils for your prakriti or unique individual constitution and your medical condition. Cardamom, the ‘Queen of spices’, stimulates the heart and mind and brings in enormous joy and clarity of thoughts. It has been in imperial use since the primordial times for its mammoth healing benefits that serve as a phenomenal tonic, expectorant, cephalic, antispasmodic, stimulant and as a promising digestive agent. Botanically named as Elettaria Cardamomum, Cardamom is well identified by its small seed pods with an outer shell enclosing the small black seeds from which its essential oil is extracted by steam distillation. Lovingly called as Ela and Truti in Sanskrit, Cardamom has been widely used in Ayurveda for its aromatic and medicinal attributes in the treatment of impotence, bronchitis, indigestion, hoarse voice, vomiting, asthma, blood pressure, poor absorption, cold, cough, bad breath, loss of taste, nervous digestive upset and mood fluctuations. As an invigorating agent for the central nervous system, Cardamom essential oil induces a sense of harmony and supports absolute fitness. Owing its origin to the Asian countries such as India, Bhutan, Nepal and Pakistan, Cardamom is a universal spice and is a member of the powerful Ginger family, Zingiberaceae. Rich in nutritional and healing properties, Cardamomis the third most expensive spice in the world standing next to saffron and vanilla. It is crowned as a medicinal herb in the Indian Ayurvedic healing methodology, dating back to 4th century B.C; Cardamom has carved its name in Charaka Samhita – the Ayurvedic encyclopedia, for its application in the preparation of various medicaments. Cardamom was an important part of the Roman and Greek trade and has numerous historical accolades. Believed to have been grown in the hanging gardens of Babylon, Cardamom has been mentioned in the works of Dioscorides, Theophrastus and even in the ancient Indian sacred books known as Vedas. Arabic medicine portrays Cardamom seeds as the best aphrodisiac and mood elevator while the Chinese medicine predominantly used Cardamom for intestinal infections, stomachic problems, gastrointestinal disorders, constipation and dysentery. In folklore medicine, digestive disorders were treated with a herbal drink made by boiling roasted Cardamom seeds along with betel nuts. Being an active ingredient in cough drops, Cardamom was administered nasally along with camphor and neem to treat cold. It is a natural mouth freshener. Cardamom is an antidote to caffeine and it detoxifies the caffeine in coffee and is used in making tea to relieve the symptoms of headache and stress and these seeds were taken along with honey to improve the eyesight. The traditional Indians used Cardamom as an antidote for poisonous bites like scorpion stings and venomous snake bites. These seeds and its oil were also used for treating respiratory ailments, gastrointestinal disorders, inflammation of the eyelids and oral infections. Being transported from East to Europe, Cardamom was highly valued as a tonic and as an aphrodisiac agent, which was used in love potions. The western world uses Cardamom for its unique aroma and sedative properties. Consisting a majority of monoterpenes with the predominant one being 1, 8-cineole, Cardamom essential oil also comprises of esters, alcohols and sesquiterpenes that includes limonene oxide, α-terpinene, neryl acetate, formic acid, α-pinene, camphene, caryophyllene oxide, nerolidol, β-pinene, sabinene, citronellal, α-terpineol, cis-ocimene, geranyl acetate, linalool, isomenthol, 4-terpineol, nerol, thymol, α-terpinyl acetate, α-guaiene, β-myrcene. The therapeutic properties of Cardamom essential oil are carminative, digestive, antiseptic, stimulant, tonic, antispasmodic, cephalic, diuretic, stomachic, analgesic, expectorant, antifungal, astringent, antibacterial, aromatic, diaphoretic, antioxidant, cooling, anti-platelet aggregation, anti-hypertensive and aphrodisiac. Ayurveda is a virtuous medical discipline that believes that every being on earth is a part of Mother Nature and it states that one’s wellness indicates absolute balance with nature and sickness symbolizes imbalance with nature. Ayurveda is a 5,000 year old healing system that has its medicinal practices recorded in Atharvana Veda, one among the 4 sacred books of India, where about 114 verses in this book talk about various illnesses and their Ayurvedic remedies. Charaka, the father of medicine and Sushruta, the father of surgery were the most famous Ayurvedic physicians and they wrote the Ayurvedic texts namely Charaka Samhita and Sushruta Samhita. Charaka says “The three – body, psyche, and soul – act as a tripod. The world stands upon them, and within them, the world abides.” According to Ayurveda, human body is a temple where the spirit lives in. It strongly recommends on keeping the body, mind and spirit pure and tranquil just like maintaining a place of worship. Every individual is approached in a unique manner even if they are affected by the same illness because Ayurvedic philosophy recognizes every human being as a distinct part of nature with a unique individual constitution, which comprises of three dynamic biological energies known as doshas. They are vata, kapha and pitta. Ayurvedic doshas administer various functions, where vata governs the functions of the circulatory system, nervous system and respiratory system, kapha is responsible for the activities of the reproductive system, movement of fluids in the body, physical build up and sustenance and pitta dosha controls the body temperature and metabolic functions. Every individual has a predominance of any one these doshas, which decides one’s figure, personality, mental attributes and behavioral patterns. Balance between these doshas indicates health and imbalance of these biological energies pave way to diseases. Ayurvedic remedies focus on correcting the dosha imbalances with the help of herbs, essential oils, simple physical exercises, Ayurvedic routine, yoga, prayers, meditation and Pranayama. Ayurveda prescribes Cardamom to treat cardiovascular problems, bronchial disorders and digestive problems. Light Miller and Bryan Miller in their book Ayurveda and Aromatherapy say “Cardamom is good for treating high vata, as it kindles Agni or digestive fire and removes excess kapha from the stomach and lungs. Its quality is sattvic and it is particularly good for opening and soothing the flow of the pranas in the body”. 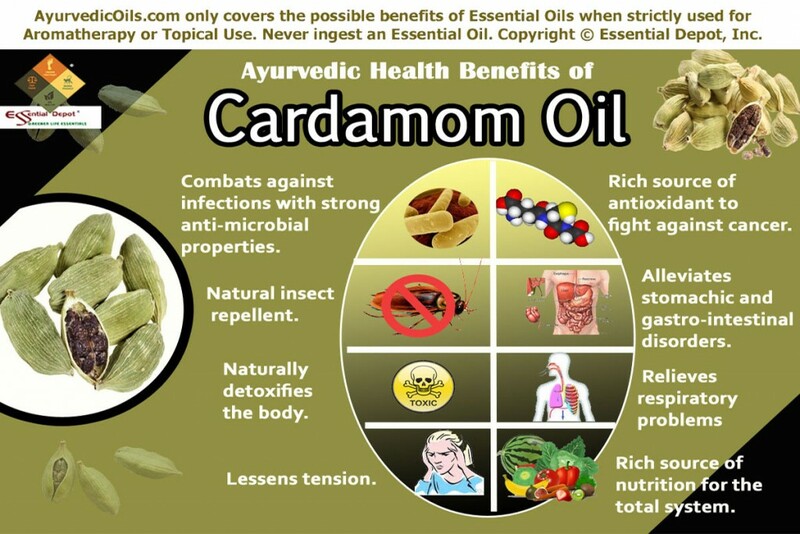 Let’s have a look at the Ayurvedic health benefits of Cardamom essential oil. With the increase in the food borne diseases caused by pathogens such as bacteria, there is an increase in the urge for searching natural antibacterial agents with maximum benefits and minimum side effects. With monoterpenes, sesquiterpenes and flavonoids, Cardamom essential oil possesses strong antimicrobial activity inhibiting the growth of numerous harmful micro organisms that cause spoilage of food. Many researches on the anti-microbial attribute of Cardamom essential oil states that it shows significant inhibitory activity against various common pathogens when compared to Fluconazole and tetracycline. The aqueous and the methanolic extracts of Cardamom essential oil inhibited the growth of gram-negative bacteria such as Escherichia coli, Bacillus subtilis, Staphylococcus aureus, Salmonella typhi, Streptococcus pyogenes and Bacillus cereus. It has been proved effective to use the essential oil of Elettaria Cardamomum in treating various infectious ailments caused by the harmful pathogens. This attribute is also applied in preserving the food items, thus proving greatly beneficial to the manufacturers of stored food products. Terpinen-4-ol contributes to the effective antifungal attribute of Cardamom essential oil making it active against various infectious fungi that include Candida albicans, Aspergillus niger, A.flavus and A.fumigatus, thus proving effectual in treating yeast infections and urinary tract infections. It has been proved that Cardamom essential oil results in yielding satisfactory results in inhibiting the growth of bacteria, mold, fungus and viruses when compared to the other antifungal pharmaceuticals. 2 drops of Cardamom essential oil added to warm bathing water or 2 drops of this oil mixed with 2 drops of Neroli oil and 2 ml of coconut oil can be applied on the affected parts for quick relief. Free radicals are always hazardous in a number of ways, leading to premature aging and even some fatal diseases including cancer. With natural phyto-chemicals such as di-indolylmethane and Indole-3-carbinol, Cardamom essential oil helps in augmenting the levels of glutathione, a natural antioxidant found in human body. Moreover it helps in combating against cancers responding to the hormone regulation such as breast, ovarian and prostate cancer. It possesses chemo-preventive quality, resulting in a significant reduction in the weight and diameter of the tumor, tumor yield, cumulative number of papillomas and the values of tumor incidence and considerable elevation in the level of glutathione in mice with chemically induced skin carcinogenesis serving as the best anti-tumor and anti-cancer agent. In addition to the phyto-nutrients, Cardamom essential oil is rich in vitamins B, C, protein and iron that make it a complete scavenger of free radicals resisting the aging process right from the cellular level and enhances the immunity. It possesses anti-tumor, anti-inflammatory and anticancer qualities, helping in significantly reducing the production of nitric oxide by macrophages that act as one of the primary inflammatory mediators. Moreover, it enhances the cytotoxic activity of the natural killer cells found in the human body, building up a preventive shield against cancer. Few valuable sources also state the positive outcome on using Cardamom essential oil in suppressing the cell proliferation in Swiss albino mice with chemical induced colon carcinogenesis proving its efficacy in treating colorectal cancer. Mix 2 drops of Cardamom essential oil with 2 drops of Orange oil along with 2ml of jojoba oil and massage it gently on wrinkles and other aging symptoms caused due to free radicals. You can also massage your system with 5 drops of Cardamom oil along with 5 drops of Cedarwood oil blended with 5 ml of Olive oil to combat free radicals, reduce the size and severity of existing malignant tumors and invigorate the cellular structure. With high concentrations of monoterpenes such as cineol and terpineol, Cardamom essential oil serves as an effective natural repellent for insects and pests. As per a 2011 research article, this oil was found to possess strong repellent, ovicidal, biocidal and anti-feeding attributes against the red flour beetle, Tribolium castaneum, the bruchid beetle, Callosobruchus maculates and the flour moth, Ephestia Kuehniella, all of which target the stored products. Moreover Cardamom essential oil is highly toxic to the adults of T.castaneum and Sitophilus zeamais, which attack the food grains such as wheat. It restrains the egg hatching and the larval stage of T.castaneum proving its ovicidal attribute. This volatile oil also actively prevents the oviposition of C.maculates in mung seeds. Few notable sources mention the acaricidal effect of Cardamom oil with 100% mortality rate against Dermanyssus gallinae, the poultry red mite. The power of Cardamom essential oil in suppressing the development of adults from the treated eggs remains as the major factor behind its insecticidal quality. Cardamom essential oil serves as a natural source of insect repellent devoid of hazardous side effects, used in protecting the food grains stored in enclosed rooms, storage bins etc. Cardamom essential oil is a natural digestive aid since antiquity. It acts as an excellent appetizer, eminent stomachic agent during meal and a great mouth freshener after meal. A herbal tea made of Cardamom, ginger and fennel serves as a natural digestive tonic and a great cure for indigestion. As an excellent digestive enhancer of all types of food, it produces an energizing effect in the body helping in the stimulation and habitual excretion of gastric juices and other acids in the stomach that aids in alleviating heartburn by balancing the acid level. Cardamom essential oil kills the bacteria in the mouth and prevents one from bad breath and treats the symptoms of flatulence and gastric disturbances. With its antispasmodic attribute, it relives you from hiccups and alleviates the intestinal cramps caused due to involuntary muscle spasms. With natural phyto-nutrients, it helps in overcoming the effect of overeating and aids you in fighting against the outcomes of gluten intolerance benefiting those with celiac disease. Cardamom essential oil showed significant results in inhibiting the gastric lesions induced by aspirin and ethanol in rats. It protects the mucus wall and aids in maintaining normal levels of gastric acid. 2 drops of Cardamom oil added to a cup of warm water can be used as a gargle especially in the morning or before going to bed or even after heavy meals to completely kill microbes in the mouth and grant refreshing breath. 2 drops of Cardamom oil along with 2 drops of Ginger oil mixed with 2 ml of sesame oil can be massaged on your abdomen for getting rid of gastrointestinal problems, diarrhea, nausea, indigestion, headache, nervous digestive upsets, morning sickness, colic and vomiting. Cardamom essential oil is an effective diuretic and detoxifier that protects human beings from the ill effects of toxin accumulation in the entity resulting to various simple and serious impacts such as premature aging, rheumatism, improper functioning of the organs and some fatal ailments like cancer. With its natural antioxidants, monoterpenes and flavonoids, this oil is an eminent diuretic helping in releasing the excess water deposits in the body through sweat and urine. It promotes the process of urination and increases the urine output creating a channel to get rid of toxins such as water, fat, acids, calcium deposits, urea and sometimes stones to build a combative cover against obesity due to water stagnation and its risk factors such as hypertension, blood pressure and cardiovascular disorders. Cardamom detoxifies the caffeine element in coffee and this combination of Cardamom and coffee is called as ‘gavah’ and is of renowned importance in the Arabian culture, where it is considered as a symbol of warmth and generosity. This aromatic oil warms up the body, aids in opening the sweat pores and maintaining the normal body temperature. The removal of excess toxins with ease and comfort poses fewer burdens on the vital organs such as kidney and liver. It leads to perspiration and its high fiber content along with the detoxifying quality helps in significantly lowering the blood pressure. Blend 5 drops of Cardamom oil with 5 drops of Jatamansi oil along with 5 ml of coconut oil and gently massage your system, followed by a warm bath diluted with 2 drops of Cardamom oil for eliminating the toxic substances in the body, reducing uterus inflammation, combating the infections in the urinary tract, strengthening the bladder in addition to treating involuntary urination and bedwetting in children and elderly people. Cardamom essential oil works wonders in regulating the blood circulation and rejuvenating the entire system. Traditional healing therapies used Cardamom essential oil in the treatment of bronchitis, whooping cough and asthma for it is known to improve blood circulation in the lungs. As a natural expectorant with balsamic aroma, it helps in breaking up even the heavy deposits of mucus and phlegm and relieves you from congestion in the lungs and sinuses. Just inhaling the vapors of Cardamom oil by adding 3 drops of this oil in steam inhalation can alleviate the symptoms of congestion, cold, chest infections, flu, chronic cough and headache. 1 drop of Cardamom oil along with 1 drop of Cinnamon oil added to gargle relieves you instantly from sore throat and pharyngitis. The anti-mucus action of this oil helps in rejuvenating the spleen and makes it an active component of medicaments for congestion. With this property, Cardamom pods are often included in milk products for its ability to counteract the mucus forming attribute of milk. Cardamom oil has cineole, which is a central nervous stimulant aids in soothing the nervous system, calming down the muscles, alleviating tension and instilling mental peace and clarity. Just adding 4 drops of Cardamom oil to the bathtub relieves you from stress, depression and combat body aches and discomfort. It enhances the potency of the nerves and relieves you from physical and emotional discomforts thus rejuvenating the inner spirit and inducing a serene state of mind by lifting up the spirits. Cardamom essential oil has been proved as an anti-depressant agent owing to its sedative effect in humans. With limonene as a mild tranquilizer, it diverts the mind and helps one to quit the addictions to awful habits such as tobacco chewing, alcohol and smoking. Cardamom essential oil has gained global recognition for its sweet aroma and positive effects on the brain and the nervous system. Inhaling the aroma of 1 drop of Cardamom oil, 1 drop of Ylang Ylang oil and 1 drop of Neroli oil added to diffuser or vaporizer can assist in relieving one from anxiety, fear, nervous wreck down and lethargy. It is highly recommended to students for its potent to increase the concentration and improve intellectual power. With its enormous healing attributes, Cardamom essential oil is a valuable source of iron, manganese, calcium, potassium, magnesium, niacin, riboflavin and Vitamin C. All these vital components help in boosting up the overall health of a person. It boosts up the immune system, helps in the generation of red blood corpuscles, and initiates the cellular energy metabolism, aids in maintaining the cardiovascular health and in promoting healthy heart rate, blood pressure and fluid levels in the body. Moreover, its rich nutrients contribute in maintaining healthy skin and hair. 2 drops of Cardamom oil along with 2 drops of Lavender oil added to your bath daily can aid in maintaining healthy skin. The antiseptic and antimicrobial properties cleanse the skin naturally and help in treating various skin infections. It rejuvenates the skin, opens up the pores and prevents the onset of acne and pimples. Cardamom essential oil acts as a natural oral aid treating mouth ulcers, halitosis, oral infections of teeth and gums and toothaches. Vocalists use Cardamom oil to tone up their voice. This oil can keep you away from scalp infections, dandruff and maintain a healthy, lustrous hair. It can act as a peroxide booster along with honey and Cinnamon in distilled water to lighten the skin without any side effects. It prevents platelet aggregation and aids in preventing blood clots that can be dangerous in certain cases. Cardamom oil is also used as an aphrodisiac alongside pepper, onion and nutmeg to alleviate impotence and other sexual concerns. This is only for information and educational purposes and is not intended to treat, diagnose or prevent any health condition or replace with any prescribed medications or professional medical advice. We are not healthcare professionals and this data is shared only with the interest of spreading the traditional values and curative benefits of Ayurveda, the mother of all healing sciences on earth. Never ingest essential oils and do remember to dilute them with appropriate carrier oil before using it on the skin externally as pure and organic essential oils are highly concentrated liquids and might have a tendency to cause allergies if used directly on the skin. Make sure that you consult your Ayurvedic practitioner/healthcare expert before choosing the correct essential oil for your medical condition and unique individual constitution. Fumigant toxicity and oviposition deterrency of the essential oil from Elettaria Cardamomum, against three stored-product insects published in PubMed. The In Vitro evaluation of antibacterial potential of dry fruit extracts of Elettaria Cardamomum published in PubMed. 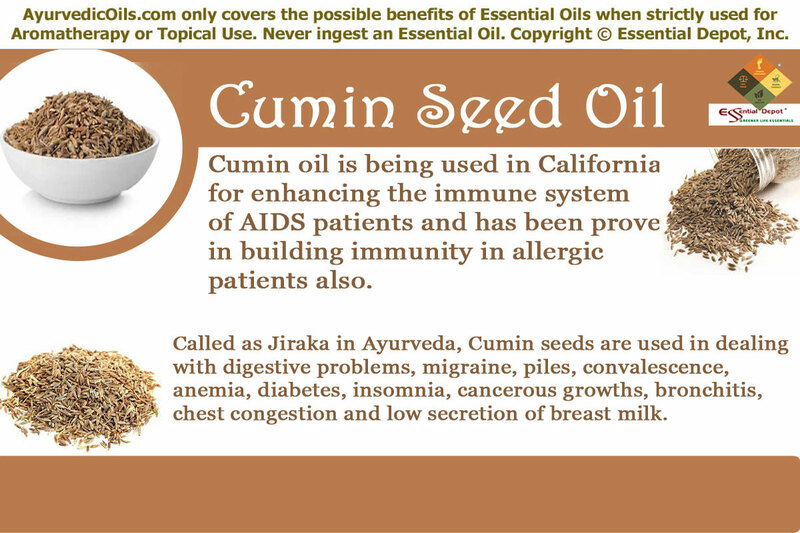 Cumin oil is being used in California for enhancing the immune system of AIDS patients and has been proven in building immunity in allergic patients as well. Celebrated as one of the most potent digestive aid in India, these cute little seeds stand special among the many natural condiments used since the ancient times, for it always blend with the food, making it extraordinarily delicious with its distinct earthy aroma and enticing flavor. Ayurveda beckons Cumin as Jiraka, Ajaji and Ajajika. Botanically called as Cuminum cyminum, Cumin belongs to the Apiaceae along with its other siblings including Parsley, Caraway and Dill. Apart from its widespread culinary uses, Cumin seeds and its essential oil are being used in addressing digestive problems, migraine, low secretion of breast milk, piles, convalescence, poor blood circulation, anemia, skin disorders, insomnia and respiratory infections. The most notable accolade to sing the glory and historical reference of Cumin seed is its use in the mummification process that dates back to 5000 years. Biblical references clad Cumin seed as one of the best offering to God. Moreover it was crowned as a tithing spice and valued as a currency used in exchange for trade. Being a native of the Mediterranean region, Cumin seed has found its application and cultivation throughout the world for its ubiquity, low cost, culinary and medicinal properties. Best known for its ease in cultivation, Cumin seed is a part of the traditional cooking. Cumin is the second most popular spice in the world; it is often used in culinary as a substitute for black pepper which was highly expensive. Being the only medicinal part of the plant this aromatic herb has been used since the primordial times as the best aphrodisiac, for which loafs of bread seasoned with Cumin seeds along with chicken were served for newly married men. As a common subject of the works of Hippocrates, Pliny and Dioscorides, Cumin was used vastly in Greece and Rome for its bactericidal, culinary and stomachic qualities. Few sources state that this herb had the ability to improve skin complexion. Cumin was also considered as a spice of avarice and greed, for which the Roman emperors Marcus Aurelius and Antoninus Pius were nicknamed as Cumin. The Talmuds used Cumin seeds in the circumcision ritual to arrest bleeding and prevent infections. Cumin seed oil and cumin seed powder are still an effective digestive aid that helps one to get rid of flatulence, indigestion and constipation. It is an active component of the Jeera water in India that grants instant refreshment and makes one to feel warm and active from within. Cumin seed oil consists of numerous chemical compounds and the major ones among them are aldehydes, monoterpenes hydrocarbons and oxygenated sesquiterpenes that include cumin aldehyde, α-pinene, safranol, linalool, thymol, myrcene, limonene, 1-8-cineole, p-menth-3-en-7-ol, p-mentha-1, 3-dien-7-ol , caryophyllene , β-bisabolene , β-pinene, P-cymene, β-phellandrene, D-terpinene, flavonoids, cuminyl alcohol and β-farnesene. Cumin seed oil also serves as a rich source of iron, copper, manganese, magnesium, phosphorous, calcium, carbohydrates, starch, Vitamin C, A & B1 and glows as a rich dietary fiber. It is often employed for its anti-oxidant, anti-inflammatory, anti-spasmodic, anti-microbial, anti carcinogenic, anti-diabetic, antitussive, stomachic, carminative, diuretic, stimulant, appetizer, galactogogue, anti-mutagenic, emmenagogue, antiseptic, astringent, detoxifier, anti-tumor, aphrodisiac, nervine and tonic properties. Ayurveda is a 5000 year old medical practice from India and the word ‘Ayurveda’ means ‘Knowledge of life’, which insists on awareness about one’s life for leading a hale and hearty living. The ancient Ayurvedic texts namely Charaka Samhita and Sushruta Samhita, written by the renowned Ayurvedic physicians Charaka (the Father of Medicine) and Sushruta (the Father of Surgery) throw light on all kinds of treatment methodologies and healing techniques used in Ayurveda. These texts even talk about complex surgical treatments including plastic surgery and caesarean deliveries even before the evolution of machines or medical equipments. Ayurveda conquers the world of medicine for thousands of years with its natural remedies including essential oils or the life force of plants, herbs, yoga, meditation, prayers, Ayurvedic routine and other Ayurvedic therapies like Panchakarma (Cleansing or Detox treatment) and Abhyanga (the art of Ayurvedic massaging). These remedies reveal the trust of Ayurvedic philosophy on the power of Mother Nature, which is made up of five vital elements namely earth, water, fire, air and space. This traditional system believes that everything on earth is a part of nature and is built up with the same five elements of nature. Every person on earth is a unique creation with a unique individual constitution that is made up of 3 dynamic biological forces known as doshas. They are vata, pitta and kapha. Each dosha is a combination of the 5 elemental forces of nature. Pitta is a symbol of fire and water and is held responsible for metabolic activities and body temperature. Vata is a combination of air and space and is in charge of respiratory functions, circulation and nervous functions of the system. Kapha is a representation of earth and water and is accountable for physical build up, reproductive health, sustenance and movement of fluids in the body. According to Ayurveda, balance between these doshas symbolizes health and imbalance causes illnesses. Ayurvedic therapies are prescribed in such a way to correct the imbalance of doshas and to be in harmony with nature. Cumin seed and its essential oil is known to decrease kapha and vata doshas and increase pitta dosha, which makes this oil as an effective natural remedy for treating digestive disorders, respiratory illnesses, nervous problems and reproductive problems. Cumin essential oil is known for its pitta-enhancing properties that are responsible for metabolism and body temperature. With the Sanskrit name Jiraka, which literally means digestion, Cumin seed oil enhances the metabolism and alleviates all kinds of digestive disorders. Indians drink Jeera water (Cumin seeds boiled in water) for augmenting their digestive potential. The presence thymol, a natural stimulant in Cumin oil along with its rich iron content induces and regulates the secretion of bile and other digestive and pancreatic enzymes that assist in easing digestion, absorption of essential nutrients and excretion. The carminative properties of this oil helps in relieving flatulence with ease and comfort along with preventing the formation of gas. The process of digestion starts in the mouth. Cumin aldehyde, the prime aromatic compound of Cumin seed oil triggers the salivary glands in the mouth that results in the proper secretion of saliva with good PH value. It also inhibits the growth of harmful microbes. The anti-fungal and antibacterial activity of Cumin seed oil is found effective in preserving food items, destroying human and animal pathogens and in protecting plants from hazardous micro-organisms in the soil. Using 3 drops of Cumin oil blended with 1.5 ml of sesame oil for massaging your abdomen, aids in stimulating Agni or the digestive fire that helps in alleviating flatulence, indigestion, dyspepsia, diarrhea, intestinal spasms, gastrointestinal infections, colic in infants, nausea and morning sickness due to indigestion. You can also add 2 drops of Cumin oil in warm bathing water or in diffuser for enhancing your appetite and soothing your stomachic disorders. Cancer has now turned as an unavoidable life threat for the whole of humanity. The presence of flavonoids, monoterpene alcohols and linalool make Cumin seed oil an effective extinguisher of free hydroxyl radicals and lipid peroxides that play a major role in oxidation that initially targets in the single cellular death and when left unattended it may lead to fatality. With its rich antioxidant property, Cumin seed oil is widely employed in preventing cancer and other health hazards caused due to cellular oxidation. A 2011 study on the numerous healing attributes of Cumin seed as published in PubMed states that no colon tumors were observed in the rats provided with a dietary supplementation of Cumin, in spite of being subjected to a colon specific carcinogen. Along with this, Cumin seed oil decreases the activity of β-glucuronidase and mucinase enzymes that functions in liberating toxins and enhancing the hydrolysis of protective colonic mucus, either of which leads to the onset of colonic cancer. Furthermore, Cumin seed is also an effective anti-mutagenic, apoptotic, anti-proliferative and anti-tumor herb enriched with the presence of Vitamin C, Vitamin A and monoterpenes that tones down the carcinogenic metabolism by increasing the activity of the corresponding enzymes. Massaging your body with 20 drops of Cumin oil mixed with 10 ml of Virgin Olive oil helps in lessening the effects of free radicals and curbs the spread of cellular damage by penetrating through the skin and reaching every cell in the system. Cumin seed oil has anti-diabetic and anti-glycating properties that assists in treating diabetes and its other associated symptoms. Certain studies on this regard state that rabbits when treated with Cumin seed oil exhibited a significant reduction in the blood glucose level and inhibited blood urea nitrogen along with inducing pepsin digestion and improvement in insulin and glycogen in tissues. The anti-glycating property of Cumin seed oil delays the onset of cataract due to diabetes. It also lowers the cholesterol, fatty acids, triglycerides and phospholipids thus creating a protective shield on the liver, pancreas and the kidneys by lowering the level of toxic substances. Inhaling the healing aroma of Cumin oil by adding 2 drops of this oil in burner, vaporizer or diffuser helps in controlling blood sugar levels, which is done when the aromatic molecules of this oil reach the limbic system and pituitary gland, the control center of the body by passing on the therapeutic properties of this oil to the entire system. As a natural stimulant, Cumin seed oil induces and regulates the secretion of hormones and enzymes especially in women. Flavonoids and monoterpenes present in this oil have an estrogenic effect that corrects hormonal imbalances and cures blocked menses and irregularities in the menstrual cycle. It increases the estrogen levels and strengthens the uterus and ovary which in turn has a positive effect in increasing the immunity. The phytoestrogens in Cumin seed oil strengthens the bones by reducing the urinary calcium excretion and increasing the calcium content in the body thus helping in dealing with osteoporosis after menopause. For dysmennorhea or painful menses, delayed or blocked menstruation and menopausal discomforts, massage your thighs, lower abdomen and genital part with 4 drops of Cumin oil mixed with 2 ml of coconut oil. Using 2 drops of Cumin oil in hot or cold compress is also a good idea in alleviating pain and treating hormone fluctuations. Cumin seed and its essential oil have thymol, which acts as an effective stimulant in inducing the secretion of milk and increasing the quantity and quality of mother’s milk thus proving beneficiary for both the lactating mother and the baby. As a natural source of iron, manganese and zinc, Cumin seed oil helps in transporting oxygen and nutrients to all parts of the body through blood and increases the immunity power of women. Cumin seed oil has an age old history of being applied on wounds, acne, boils and stitches for its antiseptic quality and quick healing attribute. Antioxidants play a vital role in maintaining the complexion and beauty of the skin. Cumin seed oil is rich in antioxidant with the presence of monoterpene alcohols, linalool and flavonoids. Moreover it is rich in Vitamin A and C, which along with the antioxidants helps in blocking the pores and strengthening the roots of the cellular tissues. It is for these strong reasons, Cumin seed oil is used in skin care for enhancing skin complexion and in oral care for strengthening teeth and gums. Mix 2 drops of Cumin seed oil with 1 ml of jojoba oil or your mild skin care cream and lotion and apply it on the skin for improving your complexion, fighting against aging symptoms like wrinkles, healing wounds and curbing the growth of microbes, which causes acne and other skin infections. Being a natural diuretic, Cumin seed oil aids in increasing the quantity and frequency of urinating. It is for this important reason, it is often recommended for people with high pressure and rheumatism. It aids in cleansing the system by reducing the bad cholesterol, fatty acids, urea and acid levels in the body. Cumin seed oil serves as a protector of kidneys and liver as it helps in effective excretion of toxins and poses less pressure on these organs. With its kapha-reducing and pitta-increasing properties, Cumin oil increases the heat in the body and results in discharging water retention and fluid deposits along with fostering active metabolism. Its stomachic property attributed by pyrazine and Cumin aldehyde helps in treating constipation and piles. Add 4 drops of Cumin oil in warm bathing water or massage your body with 20 drops of Cumin oil mixed with 10 ml of coconut oil for effective detox cleansing. Cumin seed oil helps in treating common cold, bronchitis, asthma, coughs and other respiratory tract infections, which are caused by excess of kapha dosha causing phlegm and mucus deposits to block the nasal passages, bronchial tubes and the respiratory tract. Being an antimicrobial agent it kills the harmful viruses and bacteria that cling onto the respiratory tract and its kapha-lowering and expectorant qualities help in loosening even thick deposits of mucus and phlegm thus relieving from cold, cough, bronchitis and other respiratory infections. Add 2 drops of Cumin oil in steam inhalation followed by a warm and gentle massage with the decongestant ointment blended with 2 drops of this oil on the chest, throat and back can help in relieving nasal congestion, cough, sore throat and breathing difficulties. Cumin seed oil is a natural relaxant and with its unique aroma, this oil instills a calming effect on the mind and it acts as an effective stress reducer. The presence of rich nutrients and other therapeutic chemical constituents make Cumin seed oil a powerhouse of energy that reinforces your mind and relaxes your body and results in sound sleep. Studies have also proved that Cumin seed oil possesses anti-stress and memory enhancing activity, making it a must for students with poor memory and weak intellectual skills. 2 drops of Cumin seed oil added to your diffuser or vaporizer or to a tissue placed near your pillows helps in pacifying the mind, clarifying thoughts, clearing confusions and improving memory skills. Cumin seed oil is also used in treating anemia, insect bites and in the manufacturing of perfumes and disinfectants. This information is only for the purpose of education and is not intended to treat, prevent or diagnose any health condition or replace any prescribed medicines or professional medical advice. We are not medical professionals and we share this information only with the interest in spreading the richness of Ayurveda, the oldest traditional healing methodology. Never take essential oils internally and dilute essential oils before topical use as pure and organic essential oils are highly concentrated substances and may cause harm if used directly on the skin. Always consult your Ayurvedic practitioner/healthcare professional before choosing the appropriate essential oil that is suitable for your medical condition and unique individual constitution. The essential oil of Cumin is said to have phototoxic effects, which may lead to allergic reactions, mild skin irritation, sunburn, blisters and hyperpigmentation when the skin is exposed to direct light from the sun with increased use of dermal application of Cumin oil (more than the safe level) for up to 12 hours after use. The major chemical constituents held responsible for the adverse skin effects of Cumin oil are Cuminaldehyde and certain other phenols. According to the International Fragrance Association, the safe and maximum level of dermal use of Cumin oil is 0.4%. Photosensitivity and other associated skin defects are said to occur when the safe limit of Cumin oil is exceeded and is used on the parts of the skin that are exposed to visible sunshine. This is applicable only for leave-on products like creams, massage blends, ointments and lotions and not for rinse-off products like bath preparations. Cumin oil has the status of Generally Recognized as Safe by the FDA. The Research Institute of Fragrance Materials (RIFM) reports about 5% No-observed-adverse-effect-level (NOAEL) for phototoxic effects on volunteers for Cumin seed oil. Never use Cumin oil in an undiluted manner and ensure that you always blend essential oils with appropriate carrier oils as pure essential oils are highly concentrated and might cause adverse effects on the skin, eyes and the system. The National Association For Holistic Aromatherapy (NAHA) states Cumin oil as a photosensitizer and dermal irritant thus it is always recommended to use in a diluted form and should be avoided on damaged skin, eyes, allergic skin conditions and inflammatory parts. 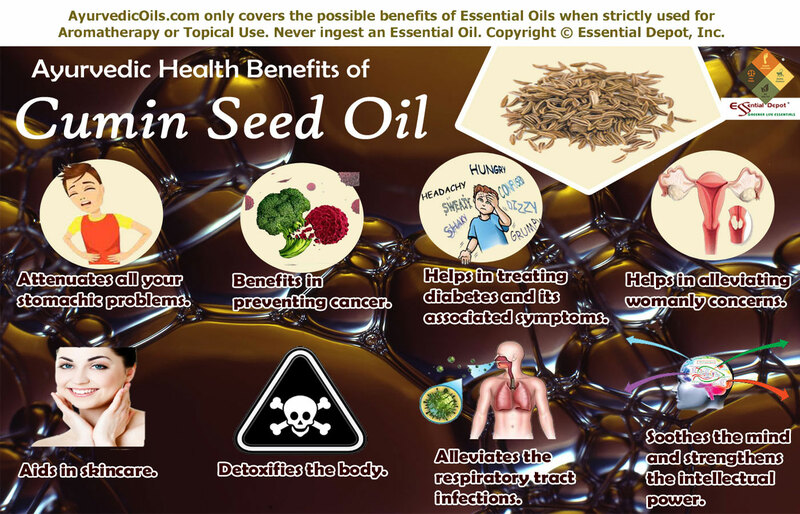 Cumin seed oil is prescribed safe only for topical applications and not for internal use. Certain animal studies have concluded that overdose of Cumin seeds proved anti-fertility activity. Cumin seeds, due to their emmenagogue properties were proved to exhibit mild abortifacient activity, when tested on rats with the gestational age of 8 to 12 days with aqueous cumin extracts. These seeds were proved to cause anaphylactic reactions on overdose. Caution should be taken in using Cumin oil, if you have a history of irritation or inflammation of the kidneys. It is also said that Cumin seeds may also cause low blood sugar so it is best to avoid the use of Cumin oil prior to 2 weeks before and after any surgical conditions. Kindly avoid Cumin oil if you are pregnant or getting ready to conceive as Cumin oil has abortifacient and anti-fertility effects, when used more than the prescribed level can end up in miscarriage, stimulate menstruation or premature labor and might delay the chances of getting pregnant. Cumin (Cuminum Cyminum) as a potential source of antioxidants by Muhammad Nadeem and Asad Riaz from the National Institute of Food Science and Technology, University of Agriculture, Faisalabad, Pakistan. A 2011 study on Cuminum Cyminum and Carum Carvi by R.K.Johri as published in PubMed. A 2009 article on Delay of diabetic cataract in rats by the antiglycating potential of Cumin through modulation of alpha-crystallin chaperone activity. Make money creating hand crafted soaps and cosmetics. 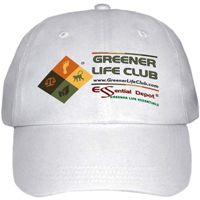 Join the Greener Life Club today => GreenerLifeClub.com Share with your friends. Watch the video below to see Greener Life Club Members at the Wine Soap Bar attending one of our retreats discovering the "Secrets of Soap Making".